A light but colorful blend, found here. A cool, soothing blue & green retreat, found here. 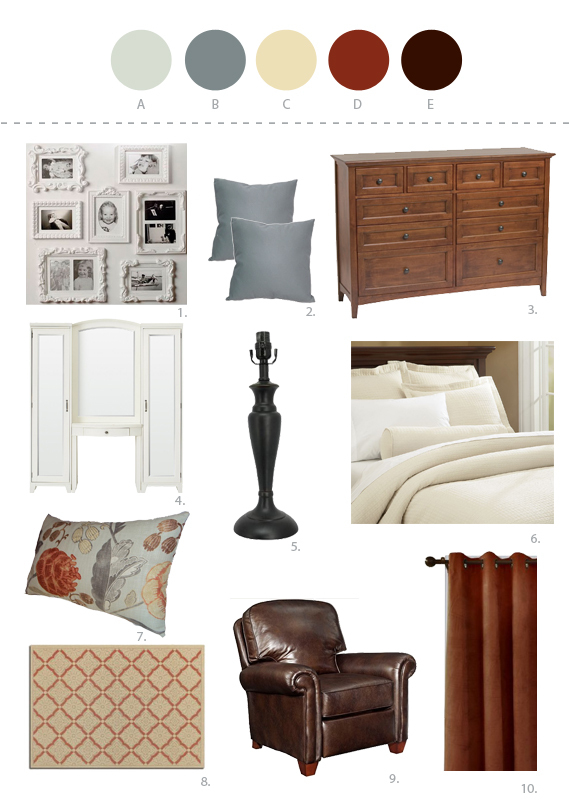 And an elegant, neutral scheme found here. 1) Most importantly, more storage in all three areas. 2) A mancave space with a secret bookcase door and all things that a mancave require -- a fridge, TV, table, and closet for all things... manly. 3) Room for the clients' biggest purchase -- a new bedroom suite that they can one day pass down to their kids. 4) A makeup vanity with lots of storage along with a renovated sink vanity near the existing closet. 5) A warm, comfortable, traditional feeling space. -Master Bedroom (upper left): The bed is placed along the north wall, flanked by two night tables. On the west wall, a long dresser of balanced by a similarly scaled makeup vanity across the room on the east wall. To balance the focal point of the bed, the existing door and new secret bookcase door will be united by framing the two elements with matching trim, including a single, extended piece of crown molding that will run from one element to the other. The space between the two will be set off with a textural element such as beadboard and the whole piece will be painted white. A tall chest placed in front of the beadboard will add a touch of warmth to that part of the room. In the corner of the room, a vignette with a traditional style chair, photo gallery arrangement, and by necessity, a wicker hamper. -Mancave (bottom left on floor plan): A recliner opposite an existing storage nook which will be converted into a built-in media cabinet with mini-fridge, tv-stand, with shelving above. For additional storage, a chest will double as a small coffee table. Finally, a new built in closet with bi-fold doors will offer extra shelving and storage for t-shirts, etc. -Sink vanity/existing closet area/bathroom (center and right side of floor plan): New tile flooring with radiant heat in this space and the bathroom will unite the two spaces. The vanity will be made over with new shaker style cabinets and flanking storage cabinets, set back for maximum counter space. A new vessel sink with an oil-rubbed bronze, pump style fixture will echo the old fashioned days of face washing with a bowl and pitcher. I apologize for the wonky angles in the shots, but what do you think of the concepts?